The Silverline half liner is excellent quality, can hold a lot of paint and yet can create very fine lines. 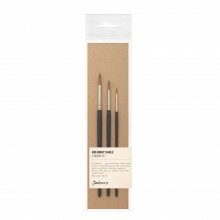 The Jackson's Silverline range is a collection of special Toray hair brushes designed to give the artist maximum mark making ability. 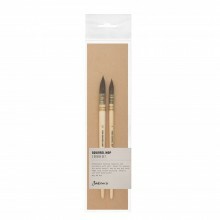 They are perfect for watercolour and decorative painting. Toray is the best quality synthetic fibre currently available. The hair retains the original shape after use and give the correct degree of strength & spring. This is a half liner; the bristles are long and come to a sharp point, so that they can hold a lot of paint and yet create very fine lines. Liners and half-liners are mainly used for long thin lines, as it is not necessary to break off a line to reload the brushhead with paint.